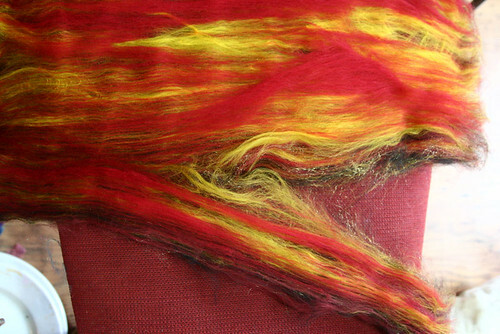 This tutorial will show you how I use my drum carder to blend different colours and fibres to make batts. If you don’t already know how to use your carder, check out my first post on the subject about the basics first, as it contains a few tips on how to get the best from your carder. 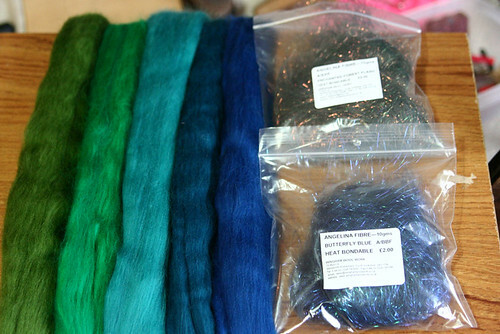 In this tutorial I am working with commercially dyed merino tops, and sparkle in the form of trilobal nylon (sometimes called firestar) and angelina. Any commerically prepped fibre can be used in this way. 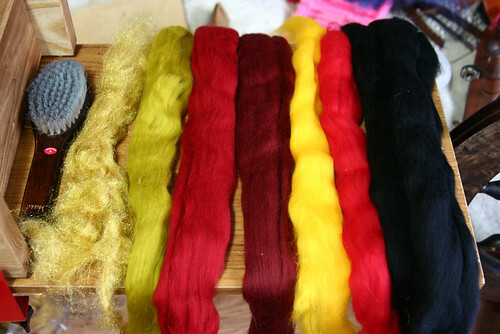 If you are wanting to blend any fibres with raw fleece, it’s easiest to first prepare the fleece as shown in this tutorial before moving on to blending. 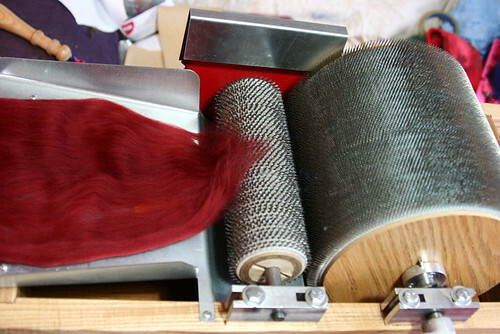 I won’t be talking about colour or fibre choices, simply the mechanics of using the carder to get the results you want. 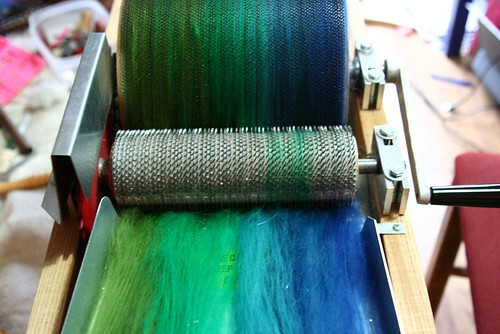 There is plenty of information online about which fibres work well together, and the book ‘Color in Spinning’ by Deb Menz contains great in-depth information and explainantions about colour theory and selecting colours for your fibre. You will notice that the fibre doesn’t reach the edges of the tray. This is where your other hand comes in, as well as using it to gently guide the fibre into the tray, you can also stretch the fibre out so it fills the full width of the drum. Once you’ve got it started, it will continue to follow the same path, so you’ll only need that hand to guide rather than spread the fibre too. Remember not to pull on the fibre, just hold it gently and guide it along as it gets pulled in. I normally use around a 30-50cm length of tops at a time…shorter if I want a more blended batt, so I can get thinner layers of different colours. After a few layers of fibre, the carder will start to look full, the fibre on the main drum will be getting close to the top of the teeth. In fact, it’s nowhere near full, it just needs squishing down. 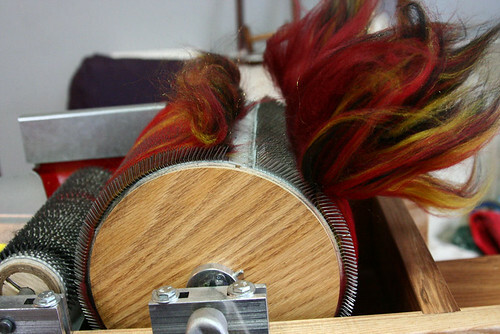 Run a bristle hairbrush over the drum while turning the handle, and this will compress the fibres and allow you to add more. 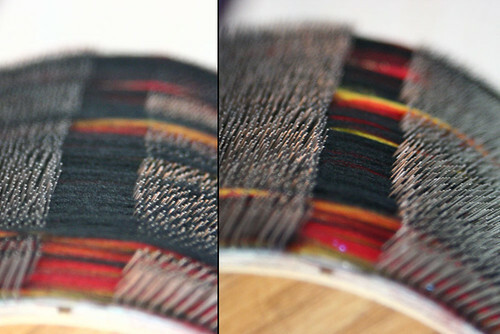 The below pic is of the drum before and after going over with the brush. 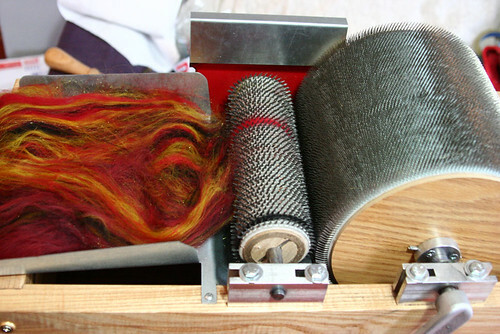 Keep adding more layers in different colours until you’ve used up all your fibre, or until the drum is so full that even brushing it won’t allow you to fit any more on. 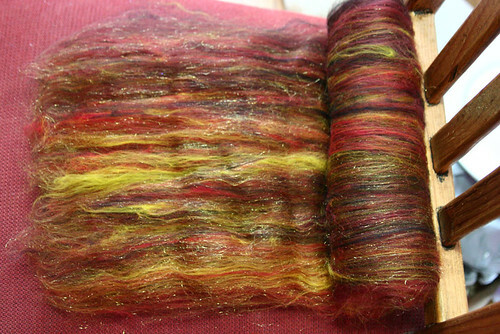 My carder will hold up to around 110g, though I try not to make batts much larger than 80g. When removing the batt, use your doffing tool to free a small amount fibre each time, working your way along the space between the teeth until the whole batt is no longer joined. Take the fibre, and roll it up away from the join. If you keep your hands close to the drum when rolling, there shouldn’t be any stray fibre remaining on the drum. Recard this strip as before, gently guiding it in with your hand while you turn the handle. 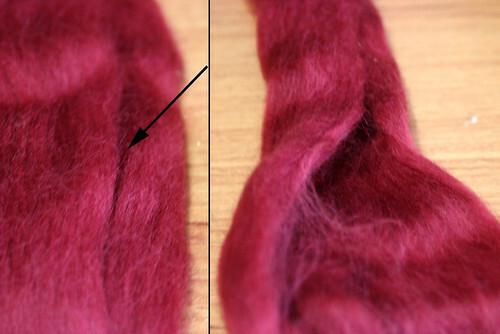 This is the effect I was looking for…blended, but not uniform, so the final yarn has patches of different colour. 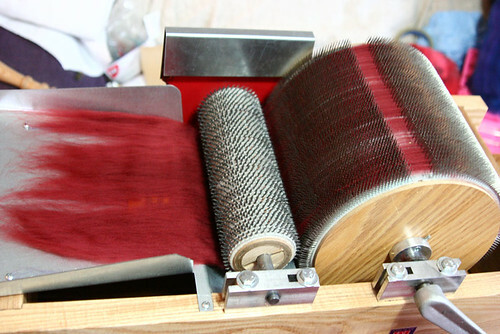 If you want a uniform batt, then repeat the stripping and carding process again until you are happy with the result. 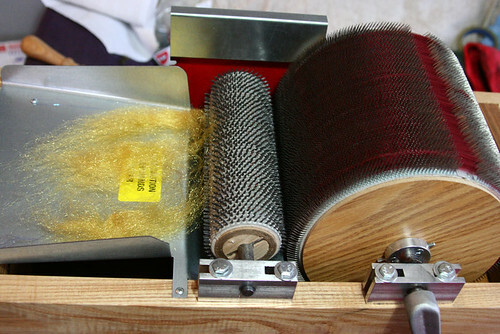 If you are blending different fibres (such as wool and silk), you will probably want to do 3 or 4 passes through the carder in total to get a smooth blend so you don’t come across patches of a single fibre when you are spinning. 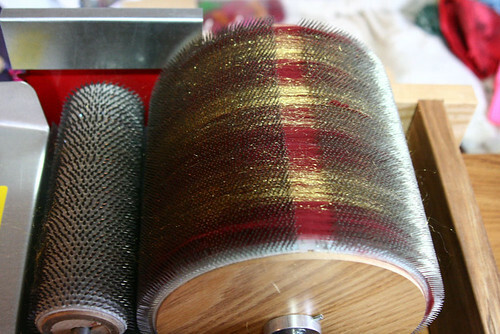 When I first started carding, I would have torn off thin strips of each colour and laid them side by side on the drum. While this works, it’s fiddly, and you don’t get a nice shading from one colour to the next….so these days I use the below method instead. Card your fibre, as above, in layers. 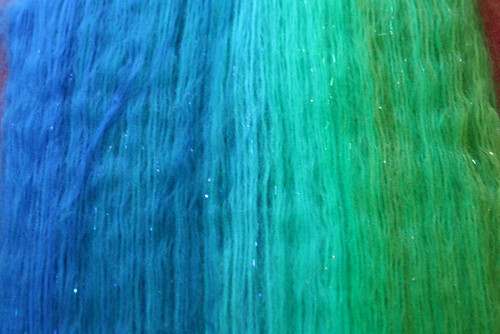 Start with the colour you want on one side of the batt, and work your way through them. 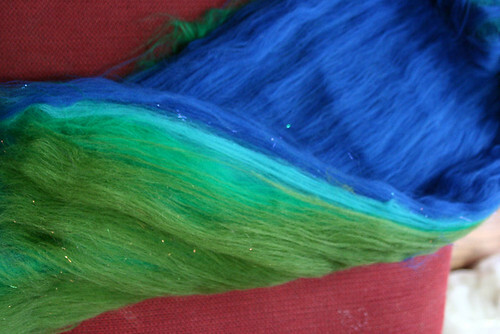 I split each colour of roving in half, and put a small amount of angelina fibre inbetween the two layers of the same colour…green angelina with the green shades, blue with the blues. Now you have to recard the batt to get the colours running across it. I hope this gives you some inspiration and the confidence to try making your own batts. Don’t be afraid to experiment with colours and textures, you may come up with something you really love! Thanks for this a good series on using a dru mcarder. I have a Barnet and have never ben teribly satisfied with my results but I am sure I will now get better results. One thing that youdidn’t talk about was the setting of the distance between rolers. have you any particular thoughts on this. I find with longer fibres a bigger gap stops them digging so quickly into the small roller. What great tutorials Vampy, thanks for all the solid info. Everyone has their own wrinkles so it is ace you are passing it all on to newbes like me. What a fantastic tutorial, I can’t wait to get started, just needed a push in the right direction. Thanks very much.